Looking for ideas for what font you'd like to use on your award? Awarding You has extensive knowledge working with thousands of fonts, including many corporate specific and custom font requests. 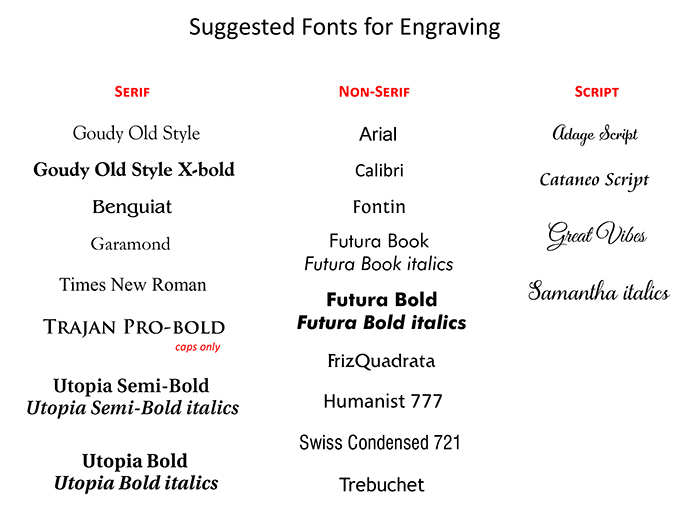 However, there are some common fonts that we recommend because they are very easy for us to scale to size on many different sizes of awards and gifts. They are easy to read, and look very attractive on a wide variety of plaques, glass and crystal awards and gift items. Contact us with any questions 800-753-3384. Use this list if you are looking for ideas. However, please note that we are not limited to these.